Students from the Lathrop Homes Chicago public housing complex now attending an elementary school some 10 blocks away recently got a bus their parents were fighting for – but some of their neighbors are still forced to walk. The bus started taking kindergarten to eighth grade students from Lathrop to Jahn Elementary School a few weeks ago. The students started going to Jahn School after Schneider Elementary School, located inside the Lathrop development, closed this past June. 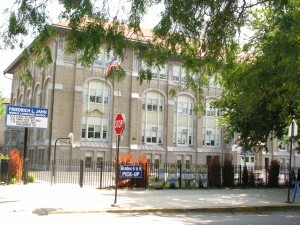 Parents claimed Schneider closed due to a decrease in enrollment, which was caused by the Chicago Housing Authority’s relocation of families from Lathrop.